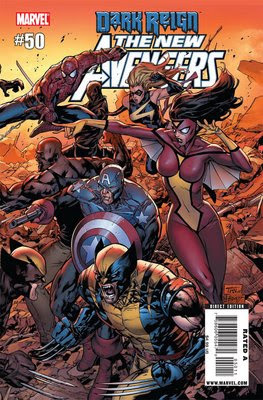 I love how Marvel celebrates the 50th issue of this series by charging us an extra buck. Oh well, I can forgive them in this case because the story in this issue was longer than usual, and even packed in some pleasant surprises in the form of guest artists. In the first part of the issue we find out exactly how the real Avengers feel about a gang of criminals assuming their superhero identities. As expected, no one is happy, and everyone is itching for a fight. While the gorgeous two-page cover promised a showdown between the New Avengers and their Dark counterparts, that's not the quite battle that unfolds in this issue (I had my suspicions all along, it seemed far to soon for that kind of thing). However the fight that does ensue is still very cool, especially when that aforementioned guest artwork kicks in. 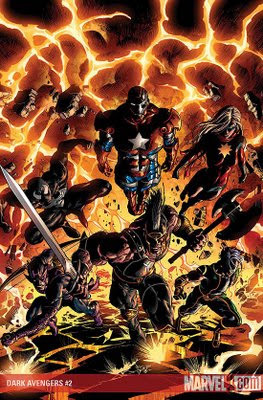 If nothing else, it was cool to see the Avengers back in action after all that Secret Invasion side-story nonsense. Marvel has been doing a great job with all their Ender's Game-related books and this issue of the Ender's Shadow series is no exception. The thing that struck me most about this particular issue was how clean the coloring looked in comparison to Giulia Brusco's work in the past two issues, which were set on Earth. In space, we get nice solid colors and Benday dots in the background; a stark contrast to the grungy city that has served as the setting thus far. 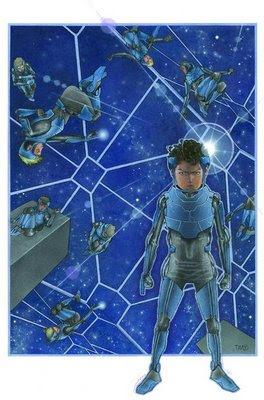 I also really love how Mike Carey is handling the character of Bean; a kid who's too smart for his own good. In this issue we get to see Bean bending rules and testing the system while unseen narrators comment on his uncanny intelligence. It really sells Battle School as being a place where individuals are constantly monitored and watched. Towards the end of this issue we hear our first mention of Ender, so my money is on the two (finally) meeting up next month. It'll also be interesting to see how the interweaving story is handled, but given the few missteps this series has taken thus far, I expect nothing less than the quality we've become accustomed to.